Today E touched on a few milestones which I'd like to share with you. E has been commando crawling for quite a number of weeks now. I think about 5 weeks. Commando crawling, for those that don't know my lingo, is when your arms pull you forward and your body drags behind, with maybe a leg or two thrown in to make you really fast. The body stays on the floor and whatever clothes you are wearing become the duster for the day. Now I do understand that it's probably very difficult learning to crawl properly on a wooden floor. However, even when she's on carpet , E won't crawl properly and I know that she can - I've seen her! It seems though that today she has decided to make a big effort to crawl properly. Yay! This has of course led to our next bit of news - E can pull herself up to standing. She's been reaching up and pulling for a week or two but hadn't realised that her knees needed to be under her body. Until now. Maybe that's why crawling has become so important to her... Anyway, it took her less than a day to realise that if she can get up on her knees, she can get up on her feet as well. 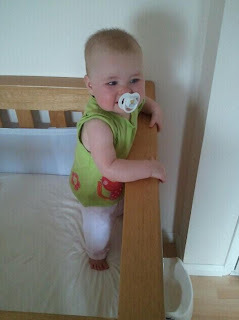 The main problem with this though is E doing it in her cot when she should be sleeping as she can't get back down yet. Not so good. 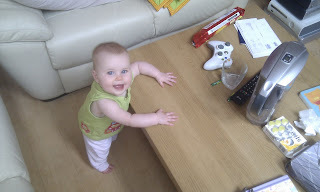 This standing malarkey did lead to a walk around the coffee table. I think E was trying to reach the cookies. As my sister rightly said, we named her well - Maryland Choc Chip were one of my nan's favourites. Ooh yes, there's the waving too! Sometimes E will wave at you if you wave at her. It's very cute! She only does it if she's happy though, which I guess is fair enough. Next she'll probably be doing somersaults or something really amazing, like sitting back down once she's standing. Watch this space.